But de Jesús’ descent was halted by the invitation and example of another Venezuelan youth, Randolph Silburan. Though he had a heart condition that prevented him from taking part in sports and other physical activities, Silburan was a joyful and faithful young man, and played an active role at Jesucristo Resucitado, the Archdiocese of St. Paul and Minneapolis’s mission parish in San Félix. One Sunday he invited de Jesús to come to Mass, and shared with him the Catholic faith. “I didn’t want to come, but he insisted,” said de Jesús, of Silburan. The two became close friends, but Silburan died at age 16 following an unsuccessful heart surgery. Today, de Jesús is one of the most active young adult members of Jesucristo Resucitado, where he is an altar server, volunteers with the St. Vincent de Paul Society and is a member of the youth group. He also regularly takes food to the local jail, where his older brother is incarcerated, an outcome de Jesús also likely would have shared if not for Silburan’s witness. “He was the motive for me to begin my Catholic faith,” said de Jesús, now 18. The story of de Jesús and Silburan captures two aspects of the reality of youth in Venezuela today: While they face extraordinary challenges amid their nation’s ongoing crisis, they also possess the potential to be a unique source of hope and joy for others during these dark times. Father James Peterson saw this dual dynamic during his nearly three years as associate pastor of Jesucristo Resucitado, an assignment that concluded this past July. The 32-year-old priest, who currently serves as pastor of Immaculate Conception in Columbia Heights, said many of the young people he met in Venezuela are disillusioned about their future. “There is a general sense of hopelessness amongst young people because their efforts don’t seem to be worth it,” he noted, identifying Venezuela’s high unemployment rate and low wages as discouraging factors. As a result of the lack of opportunity, many young people don’t take their education seriously, and they fail to set goals for themselves. Some leave professional employment to sell trinkets and food items from their homes because it pays more. Others turn to lives of vice, as evidenced by Venezuela’s sky-high rates of crime and unwed teenage pregnancy. Increasingly, however, young adult Venezuelans are leaving the country, or at least trying to. A poll conducted last year by Universidad Católica Andrés Bello in Caracas found that 53 percent of 18- to 29-year-olds were considering emigrating. The Red Cross estimates that one million Venezuelan emigres crossed into Colombia last year alone, with many of them thought to be young people. Their departure contributes to feelings of isolation and despair for those who remain. Father Peterson says the trying conditions have led some to question God’s goodness and to drift away from the faith. But for other young adults, he says, the crisis has helped to strengthen their convictions, and it has brought them closer to Christ. MISSION SUPPORTThe Diocese of Ciudad Guayana, Venezuela, is home to Jesucristo Resucitado, the Archdiocese of St. Paul and Minneapolis’ mission parish in the city of San Félix. 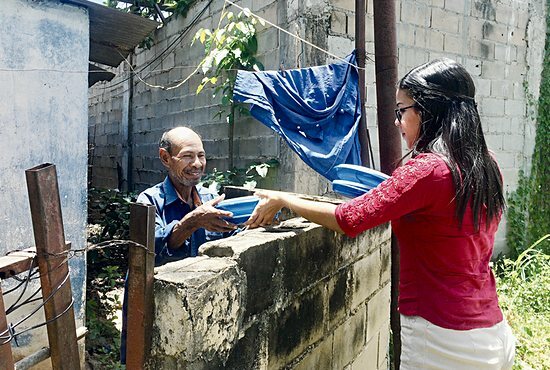 The Diocese of Ciudad Guayana receives funding to help its ministry from the Pontifical Mission Societies, which Catholics financially support annually with contributions on World Mission Day, Oct. 21 this year. Local fundraising for the Pontifical Mission Societies is coordinated by the Center for Mission. For more information, visit centerformission.org. Dubraska Medina is a striking example of the type of selflessness in the midst of suffering Father Peterson describes. The 20-year-old Jesucristo Resucitado parishioner said she has dreamed from a young age of opening her own chocolate and pastry store, but that Venezuela’s crisis forced her to put plans to pursue specialized education on hold in order to support her family. Instead of being discouraged by the setback, Medina turned her creative energy to serving the poor. She has organized a Christmas toy drive for children at a local school, and has served as a member of Jesucristo Resucitado’s St. Vincent de Paul Society. More recently, she has taken a key role in delivering meals to families who rely on the parish’s soup kitchen for food. “For me, the crisis has been a source of inspiration, to get something good out of the bad,” said Medina, adding that she encounters God through the poor. Now, she has a new dream: to start a soup kitchen in each of the 11 sectors of the parish in order to serve a greater number of people. In the immediate future, however, she has made the difficult decision to leave the country in order to pursue her education. She is planning to begin studies in Spain in January. Nevertheless, Father Peterson says that young people like Medina and de Jesús have had a profound impact on their local community, and will hopefully inspire other youths to follow their lead of faithful service.